Eyecare Specialists Optical offers prescription and non-prescription sunglasses, eyeware and accessories! The EyeCare Specialists Optical department offers prescription and non-prescription sunglasses, eyewear and accessories. Our optical staff enjoys hand picking each frame to meet all your daily needs. We offer the finest in designer eyewear frames and sunglasses as well as a large selection of contact lenses, and options to suit every style and budget. Our doctors take pride in the quality and care given to each patient, and our optical department carries on that same sense of pride by offering amazing service, expertise and selection. At Eye Care Optical you can expect helpful and informative staff to help you choose stylish and functional eyewear. We are highly trained and knowledgeable about the latest in technology in vision correction hardware. Eye Care Optical takes pride in using a local lab for your prescription lenses. When you order glasses, your lenses are made right here in the Lewis and Clark Valley. Our local lab offers in-house, state of the art technology. 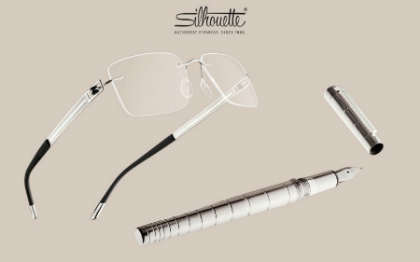 Silhouette began with a vision – eyewear as an accessory – in 1964, and is now the leading brand in lite eyewear worldwide. Under this brand, the lightest eyewear in the world is mostly handcrafted in an individual design, employing the best materials and the latest technologies. Featuring rimless, screwless, hingeless, and virtually weightless Titan Minimal Art. Get social with EyeCare Specialists! Visit us on Facebook, tips for everything optical – and more! Get social with EyeCare Optical!